CSL CS778 | RFID Fixed Reader | Esskay Technologys Pvt. 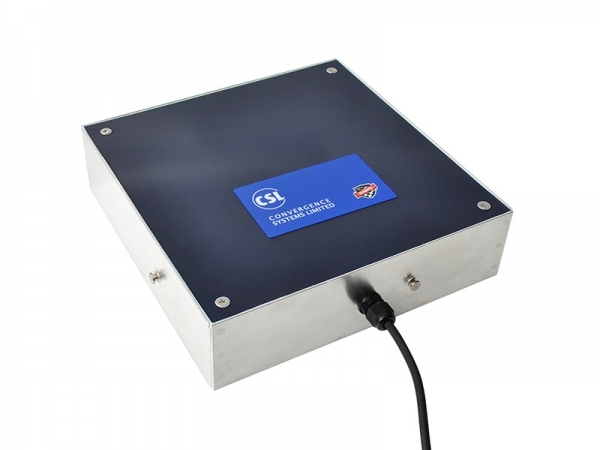 Ltd.
CS778 Square Near Field Antenna is a UHF RFID Near Field antenna for item level tagging. Near field technology allows the tagging of items rich in water content, such as food and pharmaceutical products. Designed to work in POS counter, factory production line, distribution center, hospital, casino gambling table, and other places, this square antenna allows reading of near field tags in the UHF band, with exceptional read range and read rate. Its square nature also allows it to be easily modularly combined. 2 options for cable entry: side entry and bottom entry. Side entry is best for tabletop mounting; bottom entry is best when you have multiple units stacked side by side so that side entry cable would not work.